in an interactive approach. You bring vulnerability and truth. I'll bring candor and compassion. Dr. Margaret Rutherford, a clinical psychologist, has practiced for twenty-five years in Fayetteville, Arkansas., Her work can be found at https://DrMargaretRutherford.com, as well as HuffPost, Psych Central, the Gottman Blog and others. 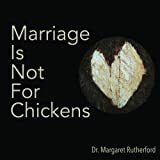 She's the author of "Marriage Is Not For Chickens", a perfect gift book on marriage, and hosts a weekly podcast, SelfWork with Dr. Margaret Rutherford. Her new book, Perfectly Hidden Depression, will be published by New Harbinger in 2019. The Perfectly Hidden Depressed Person -- Are You One?